Perfect welcome packet for seminars or take away item for new customers. 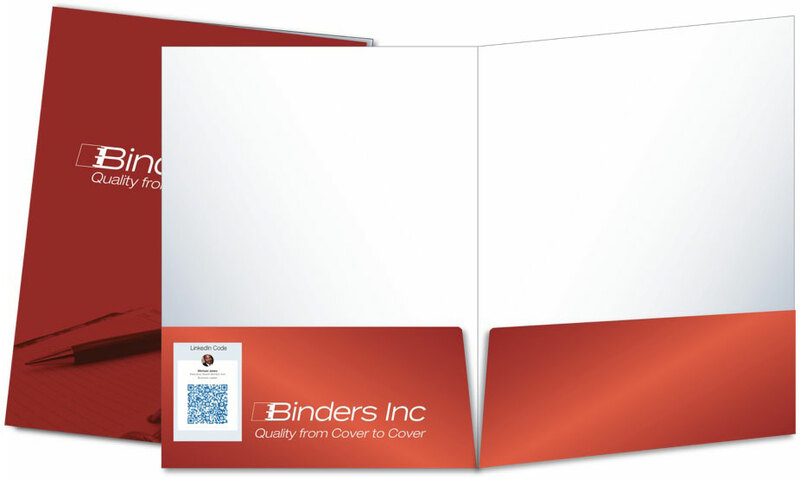 Custom pocket folders are a great way to distribute information and increase brand awareness. SIZE: You are no longer limited to a standard 9×12 folder! We make custom orders in whatever size you need. PRINTING: Your logo and design can be printed on the front, back and pockets of your custom folders. BUSINESS CARD DIE CUTS: When you want to remain in touch, being able to affix your business card is paramount. Ideal for welcome packets for new customers, conference attendees, etc. ADD YOUR LINKEDIN PROFILE TO IMPRESS: Add your LinkedIn profile along with, or in place of your business card. A simple scan of the QR code shares your linked in profile instantly. See an example below. Click here to read more. We can print in most colors on the Pantone scale. See our most popular colors here. What is the linkedIn QR code? Learn here.